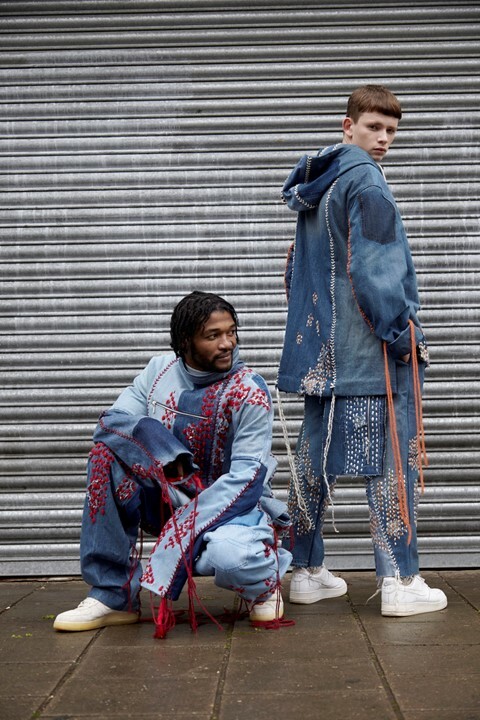 As part of the MA graduate season, the London College of Fashion hosted its annual menswear show, showcasing the work of ten graduates from the MA Fashion Design Technology Menswear course. The runway burst with creativity, offering a wealth of diversity in postgraduate student talent. Among those making their mark was the socially-responsible designer Bethany Williams. 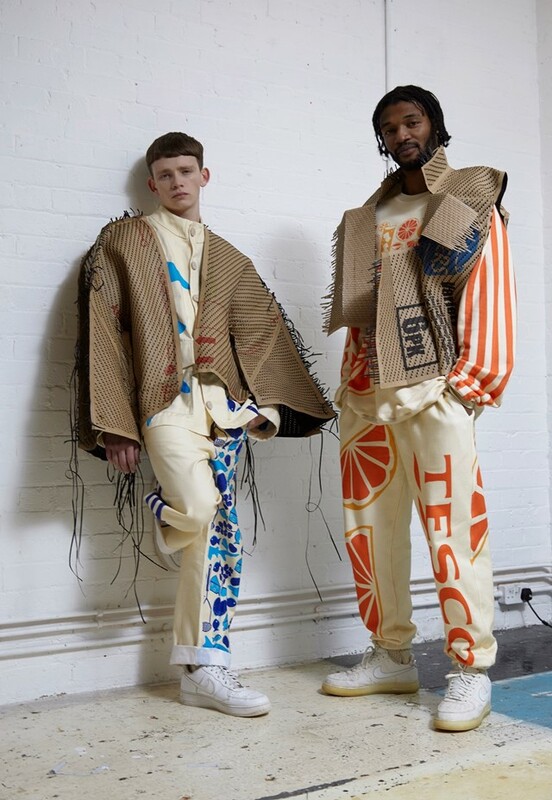 Williams partnered with supermarket giants Tesco and Vauxhaull Food Bank to create a completely recycled collection titled “Breadline”, with the aim to highlight and find solutions for the “hidden hunger” crisis in the UK. We headed backstage to find out how this young designer is striving for social change through fashion. Tell us about your story so far, where are you from and how did you get into fashion? Bethany Williams: I’m from a tiny island in the middle of the Irish Sea called the Isle of Man. My mum was a pattern cutter and designer for a factory and we had a home studio, so I’ve been surrounded by fashion from early age. Before LCF I studied BA Critical Fine Art Practice at Brighton University. The course gave me my interest in critical theory, which is the backbone of my work. It introduced me to the way art practices provide alternative systems to run against globalisation and homogenisation. Bethany Williams: My family are very creative, caring and concerned about people and the environment, which has had a massive influence on how I view the world and define my practice. I don’t want to just comment on a community, I want to give people a helping hand by working with them to create profit for connected charities. I hope to create collections embedded with real people and hope to cause a real effect in the social space we engage with. How have you realised this in your work? Bethany Williams: For the current collection, “Breadline”, we devised an exchange of fresh fruit and vegetables from Tesco for waste items from the Vauxhaul Food Bank. We developed the collection using these waste materials and recycled cardboard donated by Tesco. I also worked with local craftsmen to create hand crafted woven, printed, knitted and embroidered materials. Every one of our garments is 100 per cent sustainable and each component is either recycled or organic and made in the UK – for example, our button-makers plant trees, and we’ll be donating 30 per cent of profits to Vauxhall Food Bank. Each denim look consists of nine pairs of recycled jeans and each knitted look consists of six jumpers. I also want too let the consumer know who exactly made their garment and how long it took to produce. My aim is to provide an alternative system for fashion production, as I believe that fashion’s reflection upon the world can create positive change. Why did you decide to partner with Tesco? Bethany Williams: Tesco are a massive supporter of the Trussle Trust Food Bank Charity and visit the Vauxhall Food Bank where I volunteer regularly, so the decision came very naturally. I also think their “Everyday Value” branding is fun and makes a playful print. Why should fashion be used as a tool to comment on wider issues? Bethany Williams: I believe that social and environmental issues go hand in hand and through exploring the connection between these issues we may find innovative design solutions to sustainability. Fashion encompasses all industries – from agriculture to communication – so it has a huge impact on the planet, producing 80 billion new garments each year and employing one in six people on the planet. By providing an alternative system for today’s social structures and services, the enormous fashion industry could be used to create social change rather than exploitation. Political economists argued two centuries ago that economies are based on three functions: production, consumption, and exchange. Exchange economies could be applied to fashion, creating a political effect outside of itself. Instead designers would step away from discussion and representing political and social issues, and emphasise by actually “doing things” in the world through their work. Like Ukrainian Frolov’s design practice who during Ukraine Fashion Week, stopped production of his ethereal collection to switch to making bulletproof vests for protesters.